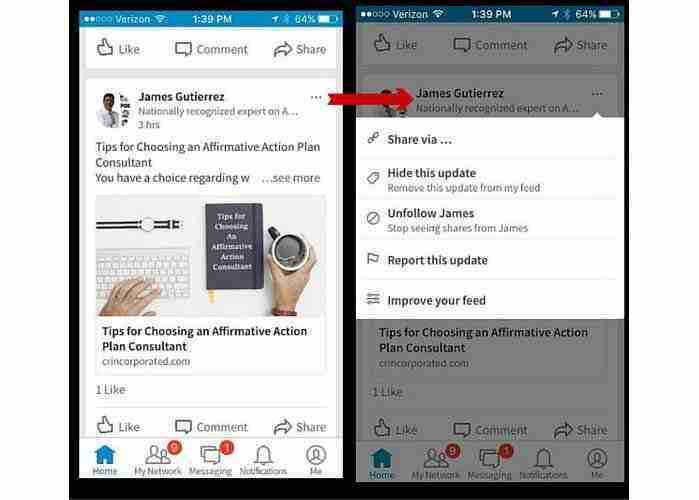 LinkedIn has provided us the ability to customize to an extent what we see in the LinkedIn Mobile newsfeed from the HOME page. This means that you can offer amazing relevant content that gets found easier and elevate your brand on LinkedIn. 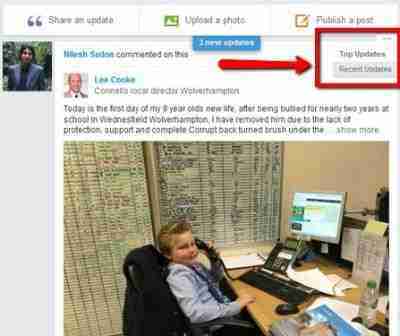 What is important to know about the LinkedIn desktop – mobile newsfeed is that they are NOT the same. I have noticed that content I see when viewing my mobile device is not identical to what I am seeing on my desktop. Mobile is showing more content than the desktop version. I have noticed that with the desktop version, I don’t see the newfeed content change as frequently as I do on my mobile. For example, sometimes the top post when I click on the home page could be something posted hours before. The reason it rises back to the top is because someone just added a comment to the post. Now this is great if you posted the original LinkedIn status update, but if not you may continue seeing the same post over and over again. If you don’t want to see the same post over and over again, click the 3 dots in the upper right corner until you get the drop down menu and choose “RECENT POSTS” and you newsfeed will populate in order of the most recently posted status updates. It has been reported that well over 50% of LinkedIn users are now using mobile vs desktop. The mobile app is very robust and it appears LinkedIn has invested in this technology to provide a better user experience – very smart on their part to capitalize on the growth of mobile. I have experienced a big difference in the content I am shown from the HOME page on the LinkedIn mobile app in terms of content changing more frequently. In the example above that same post was hard for me to locate on my mobile device, in fact, I scrolled and scrolled to even locate it. So the content is changing more frequently on mobile vs. desktop which stands to reason if more people are using mobile. The other interesting thing I think that you should know, on desktops the only options you have for changing the newsfeed content is to HIDE THE UPDATE, SHARE THE UPDATE, UNFOLLOW the person who posted it or REPORT the post which I would not ever do unless it is totally inappropriate. If you do not care for the type of content a person posts, simply HIDE the update or just stop following the person. If you made a comment or click the thumbs up like, you will continue to get more updates from that person and similar posts. Conversely, when you view the same post on mobile you have one very important new option to what you see called IMPROVE YOUR FEED. When you choose this option now LinkedIn gives you the option of following other people in the same industry that your peers are following! If you choose to follow any of these people their content will now show up in your newsfeed. Have you noticed more video appearing n the newsfeed? Video is taking over on other social sites as live streaming has on Facebook. Video attracts attention and if done well it can convey a brand message better than any other media. 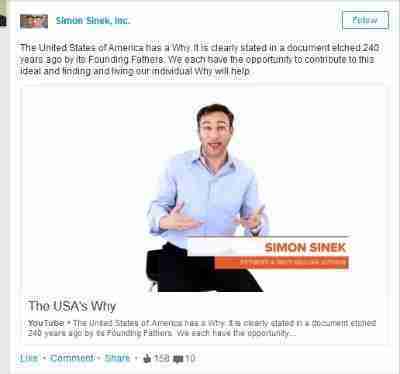 It can be used effectively to drive leads on LinkedIn. Did you know that when you scroll your news feed that you can turn on or off the autoplay feature in your settings? If the YES toggle is on, then when you scroll directly over a video it will auto play. To adjust this go to PRIVACY & SETTINGS – under ACCOUNT – look about half way down on the page for AUTOPLAY VIDEOS. Your video likely will be hosted on You Tube where you will grab the link and then post it at the end of your text n the stats update the same way you would do with a link to an article. You can also post a video link and a link lets say to a wed page or lading page that you want to drive people to. The trick is posting the You Tube link first and when you see the thumb nail of the video populate go ahead and erase the link and paste in the link to the page you want to direct people to. The viewer will still see your video auto play in the newsfeed in addition they can click the link to the page you added. Great feature! 1. 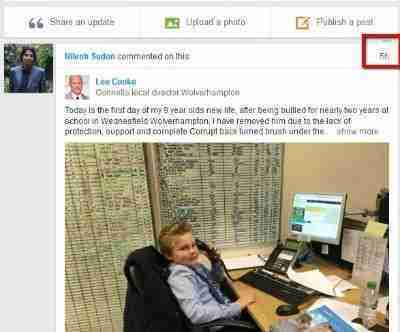 Move your cursor over Interests at the top of your homepage and select Companies. 2. Click the Following tab near the top of the page. 3. Hover over the Following link beneath the company you’d like to stop following and click on the Unfollow. No one outside of LinkedIn knows the exact algorithm of how a post shows up in the newsfeed. When you initially publish your post your network is notified but it is unlikely that it shows up in the newsfeed of all of your followers. With millions of people now publishing content, competition is fierce. It appears that LinkedIn gives preference to their ‘Influencers’ throughout the Pulse network. Published posts are searchable from the top navigation bar by keyword and topic. It is also important to know that your posts will show up in a Google search based on keyword. 1. Avoid cutesy or clever titles. Always include your primary keyword in the title. 2. Include your keyword in the first paragraph and throughout your post. 3. Include a strong image that enhances the point of your post. Be sure you have added your key word to your photo. 4. Promote your post on other social channels and if it is evergreen content, re-post from time to time. Buying ads to promote posts can spread your content far and wide and build a new audience quickly. If you do buy advertising I encourage you to have a strong call to action in the footer of all your posts letting people know how they can get more of your content. This could be in the form of a subscriber opt-in or link to your website. Be sure you always reply to any comment you receive. Comments and likes will elevate your content into the newsfeed because LinkedIn believes it to be credible and relevant. Post with consistency both in terms of frequency and topic. Write about what you want to be known for until you are an ‘Influencer’ and you can write your opinions about anything you want. Request my specialized LinkedIn training for aspiring individuals to learn more. Customizing your LinkedIn desktop and mobile newsfeed does take some intentional actions so the more you comment and like on posts, LinkedIn will show you more of that type of content. Taking the time to hide updates and unfollow people whose updates you don’t like will get you a cleaner newsfeed. The LinkedIn newsfeed can offer a great place for news from your LinkedIn contacts, companies, Influencers and LinkedIn themselves. For more tips to get the most out of LinkedIn read 6 Daily Things to Do on LinkedIn. Engage our professional services to avoid latency for your LinkedIn mobile news feed and making your feed more relevant by building its features. By partnering together we can improve your LinkedIn newsfeed to become the more important to both your users and your business.